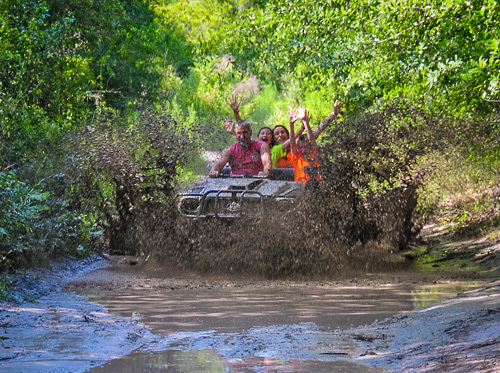 Revolution Off-Road Mucky Duck offers a one-of-a-kind experience for up to four people to ride in an amphibious six- to eight-wheel vehicle through the wetlands of Clermont. 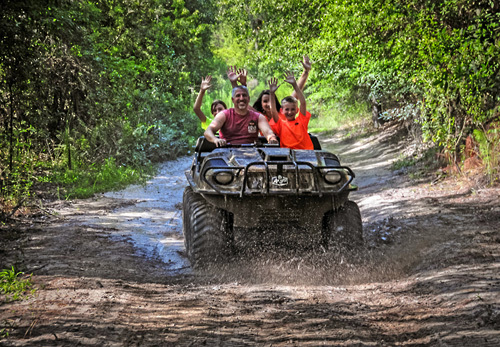 The experience offers a guided tour that includes two occasions of driving through the river, safety equipment and instructions, as well as plenty of mud and dirt to take back home. Just 30 minute drive from Walt Disney World area. Must wear closed toed shoes. Drivers under 18 must have a guardian with them to sign a waiver. Must be at least 45 inches to be a passenger and be able to sit unaided. 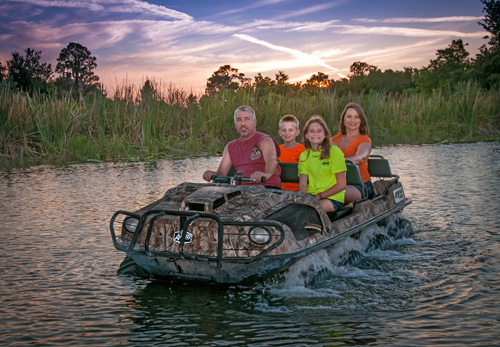 Mucky duck is an amphibious vehicle, covering both water and land. Explore the beautiful Florida countryside. Guides are included on tour. An Argo is an amphibious vehicle with 6 or 8 wheels and at Revolution it is called The “Mucky Duck” because it describes this vehicle better than an “Argo”. The course for the Mucky Ducks is set amongst some of the prettiest and natural of all of the trails at Revolution. It travels through the wetlands, along the outskirts of the property and around the edges of the lake through muddy gullies and on two occasions drives off the bank and into the lake, enough to take your breath away but a gentle landing in the water. The eight wheels on this vehicle makes it much more of a gentle ride across the tracks than the other machines we have on property. It can seat up to 4 people comfortably as long as their combined weight is not more than 1000 pounds. This is a guided tour and you will follow our instructor around the trails in your own vehicle. You must hold a full license to drive and be over 18 years of age but as long as you can sit unaided you can be a passenger in the Duck to enjoy this totally unique experience. Safety equipment and safety briefing is included in the package price. Ask about “Sunrise Mucky Ducks” tour which includes Breakfast and souvenir t-shirts. You should wear old clothes as you will get dirty they are not called “Mucky Ducks” for nothing. You should also wear some closed toe shoes to protect your toes. Shorts are perfect if the weather is hot and of course sun hats and sun screen. NOTE: Passenger ticket must be purchased with an Adult Driver ticket.